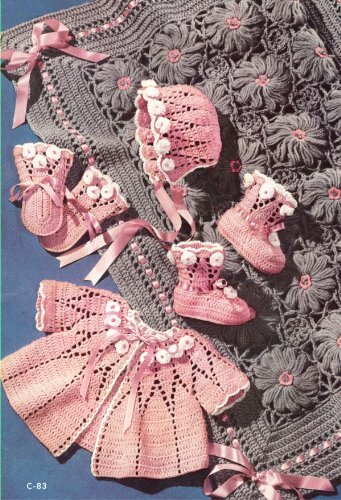 Vintage Crochet PATTERN to make – Baby Sweater Cap Booties Blanket Set. NOT a finished item, this is a pattern and/or instructions to make the item only. Amazon Price: $7.99 (as of April 26, 2019 7:48 am - Details). Product prices and availability are accurate as of the date/time indicated and are subject to change. Any price and availability information displayed on the Amazon site at the time of purchase will apply to the purchase of this product. 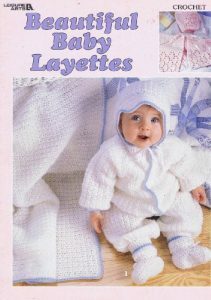 Vintage Crochet PATTERN to make: Infant Sweater (sacque), Bonnet (baby cap, hat), Booties (soft shoes), Blanket (Carriage Robe, baby afghan) & Mittens Pattern. Decorated with little rosettes. Carriage Cover is 33 x 42 inches completed. Size: Infant. Make with Chadwick's Red Heart Baby Wool and Clark's O.N.T. Plastic Crochet Hook No. 3. Gauge: 6 dc make 1 inch; 3 rows make 1 inch. Each Vintage Home Arts pattern comes in an acid-free archival quality sheet protector ready to be placed in a binder. An additional free Vintage Home Arts pattern (our choice) is included with every order. This pattern is a cleaned and restored reprint from the exclusive collection of Vintage Home Arts and is copyright protected. Again, this is NOT a finished item, but a pattern to make an item.